Champagne, Parmigianno Reggiano, Jamon Iberico… Sometimes a place is so fundamental to the food that it’s not worth reinventing the wheel. 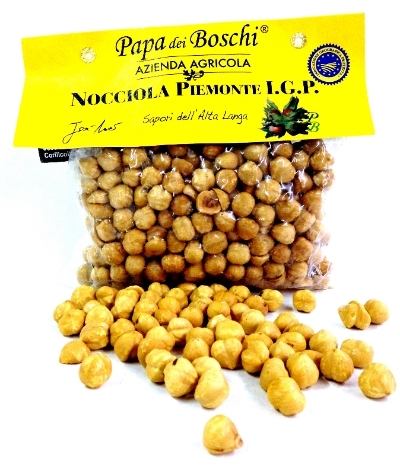 We would say that the same holds true for hazelnuts from the Piedmont region of Italy. The hazelnut tree indigenous to Piedmont is so delicate that attempts to grow the varietal in the United States have been unsuccessful. Today, the majority of domestic hazelnuts are grown in Oregon, using the Barcelona varietal, which was brought from Spain to the west coast in the late 1800s. Oregon produces twice as many tons of hazelnuts every year as Piedmont, though the world leader of hazelnut production is Turkey. Despite Piedmont’s minuscule production, their hazelnuts still stand their ground with an intense, sweet, hazelnutty flavor. By comparison, hazelnuts from Turkey and Oregon are larger, but also have more bitterness and woody tannins. On a historical side-note, the Piedmont region’s bountiful hazelnut crop became a thing of legend when a chocolate shortage caused by the Napoleonic wars forced a local confectioner to use hazelnuts to stretch his chocolate supply. Nocciolata was born; though most people today recognize it as Nutella. Our Piedmont hazelnuts come peeled and toasted in vacuum packed bags to preserve their freshness. If you have any questions don’t hesitate to call us at 612.521.8725, we love talking about food!